Our day-to-day activities are often influenced by a basic necessity — sleep. Sleep quality is one of the most essential aspects to consider about lifestyle. It does not matter how much sleep you get if the sleep is interrupted, uncomfortable and restless. It is important to choose the right mattress for your bed. Often, the mattress is not big enough to accommodate the number of people sleeping on it. This can make people feel cramped and uneasy, and impact their sleep quality. In such cases, two mattress sizes are considered to be good options — the king (or the “Eastern” king) and the California king (or the “Western” king). There are subtle differences between the two sizes. While they are both larger than the other sizes, they have an important difference in size when compared to each other. The usual debate between the California king vs. king is the size of the mattress. The king mattress is technically the bigger of the two. It is 76 inches wide and 80 inches long. This gives it a total surface area of 6,080 square inches. This makes the mattress slightly bigger than the California king which is 72 inches wide and 84 inches long. This mattress is longer than the king but measures a total surface area of 6,048 square inches. Both mattresses are good choices for those who feel cramped in their current beds. Though, you must consider a few requirements before choosing between the two sizes before making a final decision. The most important aspect of buying a mattress is to opt for a size that is convenient and suitable. The size of the mattress is dependent on the number of people meant to sleep on it. Couples with children may find the king mattress convenient due to the extra width. Additionally, pets that snuggle up vertically will need extra space. However, if your pet sleeps at the foot of your bed, a California king mattress can accommodate your partner and a pet. It is also sufficient for just couples who don’t need too much space between themselves. Finally, the size of the room is an important condition. Both mattresses require big spacious rooms. The width and length of a room can vary — the king mattress is suitable for a wider room, while the California king can fit well in a longer and narrower room. You can also consider the size relative to the other decor and fittings in the bedroom. The bed must not look like it is overcrowding the bedroom. Ideally, there must be a space of 2 feet around the three sides of your mattress. This will allow you to walk around and maneuver around the bed. The price for both mattresses is quite similar. The price difference, though, lies in the maintenance of the mattress. The California king is a new and rare size. This makes it difficult to find affordable bedding for this size when compared to the common king mattress. This results in ordering custom-made sheets or exclusive California king sheets that tend to be quite expensive. Further, if you are moving from a king size to a California king size, you will have to invest in a new bed frame. These additional costs, make the California king an expensive affair. The occupants of the bed can also determine the choice of mattress. Since comfort is a major motivator for people to change or upgrade their current mattress, you must identify the needs, comfort and requirements of those meant to occupy the bed. Those who are 6 feet and taller usually struggle to find the right mattress. Although some people prefer their legs dangling off the bed, most people find this to be quite uncomfortable. They can opt for the California king as it provides the maximum height in mattress sizes. Alternatively, for those who prefer to spread out and sleep, a king mattress provides ample space. If you are a couple, it allows each person a personal space that is as large as a single twin-sized mattress. Both mattresses are a great option for anyone looking to upgrade their mattress to a bigger size. However, they differ based on certain peculiarities. The difference is slight but definitive. By weighing the pros and cons of both sizes and considering personal requirements, you can choose the right fit for your bedroom. The California king mattress is a good option for those looking for a longer mattress to accommodate tall people. It also has more foot room which is good for people who tend to slide downwards when asleep. The sleek and narrow dimensions of the mattress lend a modern look to the bedroom. It is inconvenient for those who prefer to spread out and sleep with ample personal space. Extra sleepers like children or pets can also make it uncomfortable. Bedding and other accessories (bed frames, box springs, protectors etc.) are rare and expensive. The king mattress provides a wide open space for couples to spread out and sleep. It can also accommodate children and pets, who like to snuggle up with couples. It is a common and popular size and therefore it is easier to find affordable bedding and accessories. It may not be suitable for taller people. Unless the bedroom is very spacious, the width of the mattress tends to make the room look overcrowded. The king mattress continues to be a popular choice amongst most families. The size and affordability make it a good option. 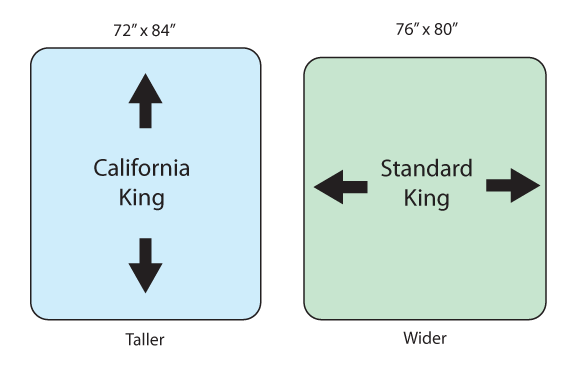 For those of you struggling with a shorter mattress size, the California king can be a blessing. It is advisable to consider your requirements and weigh the pros and cons before choosing your mattress size. The king mattress is generally considered to be perfect for most couples and families. It is also the wise choice for those who are on a budget.